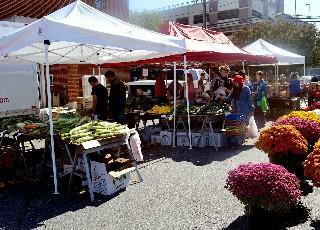 The Downtown College Park Farmers Market has been active since 2011 and currently serves both residents of College Park and students at the University of Maryland. Patrons can frequent the market on Sundays from 10:00am to 2:00pm during the season, which runs from April to November each year. All food must be grown within 150 miles, limiting the amount of emissions released in the transportation of the food to the site. Some farmers who sell at the market use organic farming practices, thus limiting their use of pesticides, hormones, and chemicals that are potentially hazardous to human health. In turn, members of the community have the opportunity to purchase minimally processed foods with greater nutritional content while giving local farmers the ability to compete in an economy that is becoming increasingly dominated by industrialized agriculture. Also, some vendors accept Farmers Market Nutrition Program Checks and WIC Fruit & Vegetable Checks. All in all, the Downtown College Park Farmers Market is a win for the environment and the local economy alike.